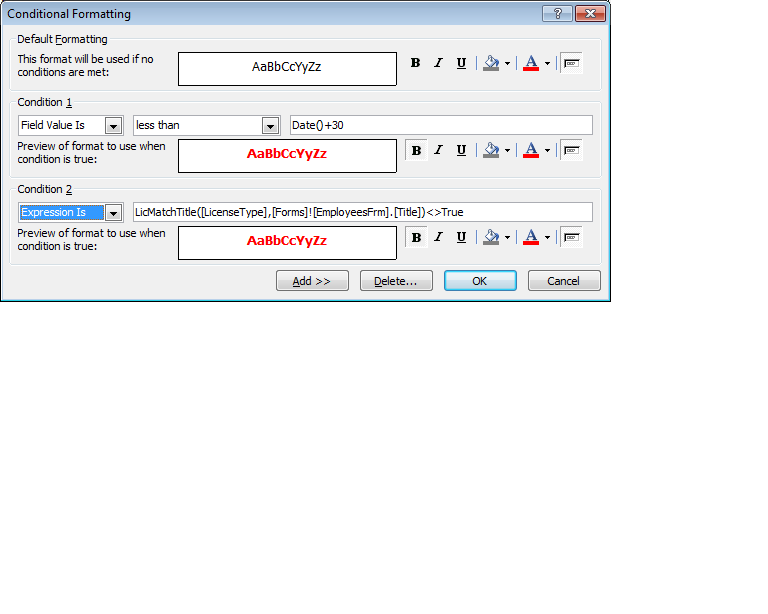 I have a textbox that is set to display red fonts in two conditions, see attached. While the first condition works, the second condition only partially works, meaning if I only have that cond. in place then it works, however if I have another condition besides this then it doesn't. Whichever condition returns true first, is the one that rules. So if some date is less than current date + 30, then that condition is applied and no other condition is checked. Whichever condition returns true first, is the one that rules. I know that, my problem is in a case when first condition is not true and second is true, it doesn't get red. I figured out a workaround.. Included the logic of the first condition in my function so its only checking now for one condition.